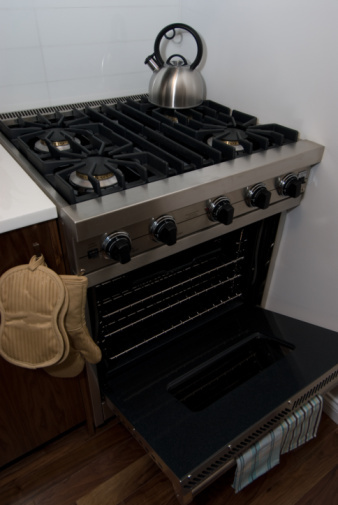 What Is the Difference Between Forced Air Ovens & Gravity Flow Ovens? Heating can be done slowly by letting the natural movement of heated air occur or more rapidly by pushing the air around. Forced air and gravity flow heating methods are used in cooking and heating ovens, the latter sometimes called furnaces. The application of a specific heat delivery method does not change the characteristics of the forced air or gravity flow. A direct comparison of the heating means will help you to choose the best option, whether you need a cooking oven or a furnace. Many modern home ovens use forced air to cook food faster. When air is heated, its particles spread out and the air expands. Since its particles are spread so far apart, the hot air weighs less than the cooler air around it, causing it to rise. As the air moves, it loses some of its heat energy through its movement and it cools. When the heated air cools enough, it reverses direction and begins to sink back to the heat source to be heated and repeat the process. This continued rising and falling of heated air is called natural convection or gravity flow, and it is the heating method used in conventional ovens and with older furnace models not equipped with blowers. Forced air heating warms the air, and uses a blower fan to push the air around the oven chamber or through ducts. These create a more even distribution of the warmed air, but the force of the fan can cause excessive drying. These also are known as convection heating products. When referring to cooking, forced air and gravity flow ovens have different names. Forced air ovens are called convection ovens and gravity flow are known as conventional ovens. Choose a conventional (gravity flow) oven if you frequently cook delicate items that might be damaged by air moving in the oven chamber. Convection (forced air) ovens are better for general cooking. The even distribution of the hot air through the chamber by the convection fan cooks the food faster than a conventional oven. In the United States, an oven is another name for a furnace that burns at relatively low temperatues, according to "Industrial Furnaces, Volume 1," by Willibald Trinks. Even if the oven is referring to a furnace, forced air and gravity flow options are available. Gravity flow heating is done by creating steam in a boiler. The heated steam rises through the pipes to condensers around the house, where it cools and changes back into water. This water flows, via gravity, back down to the boiler. Forced air furnaces use a fan to force the hot air from the furnace through ducts to the various rooms in the house. As with a cooking oven, forced air furnaces can dry the air out in a home, because of the drying effect of the moving air. Gravity flow heating creates a gentle, even heat without drying out the air.